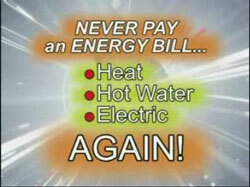 Imagine a machine that could make Free Electricity at your home - indefinitely! Imagine using all the power you want for FREE, using technology that can tap a virtually unlimited source of energy while producing zero pollution. How would it be to set your thermostat to any temperature you like, and use your lights and electrical appliances as much as you want with no cost at all! See several ways that could make free electricity, and see a variety of other revolutionary technologies. How might a free electricity system work? One way it could be done would be to couple a Hummingbird Magnetic Motor to a Sundance Magnetic Generator: In 1999 Dennis Lee and company traveled to 47 States with a technology show in which he demonstrated the Hummingbird Magnetic Motor, delivering 5 times more horse power, than was supplied to it. The energy extraction / harvesting is done by the Hummingbird's incorporated magnets. to you at your home! 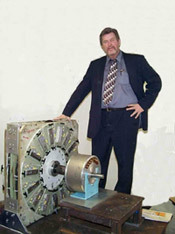 In 2001 Dennis Lee did a 50 State Tour, featuring the Magnetic Sundance Generator which he demonstrated to be 100% efficient. If a 500% efficient motor is connected to a 100% efficient generator and one of the five energy units of power is used to keep the Hummingbird motor going, that leaves four (4) free units of power harvested from the motor's magnets. What do you know about magnets? If you have one or more magnets on your refrigerator, have you ever wondered how those refrigerator magnets hold their own weight up against gravity virtually forever with no glue? That's an observable expression of free energy, right there on your refrigerator! Would the Hummingbird & Sundance be Noisy? No, it would be quiet, unobtrusive and non-polluting. Did you know that cars can be powered entirely by water? Stanley Meyer did it many years ago. Unfortunately the Pentagon conscripted him "ostensibly" to power army tanks with water, though its not apparent the real purpose was to get Stanley Meyer out of circulation. On March 21, 1998, at a dinner celebrating their success, Stanley was poisoned and killed. 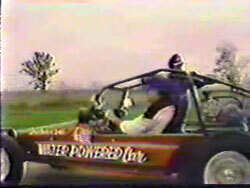 Cick the image to see the long original video version of Stanley Meyers driving his water powered car when his car was featured on the news. Incidental Note: I added this video to my website more than 25 years ago and others have since cloned it for their websites. I had this video on my You tube Channel but it was unjustly removed. It was one of many other Tesla Society videos I do have on my channel that were not unjustly removed. This one is Standley Meyer's presentation at the "International Tesla Society". Powering cars with water can be done now. The water is not destroyed. It's separated into hydrogen and oxygen then cleanly burned with no pollution, and finally from the exhaust there is water again. Washington Major newspapers ignored the historic 1903 flight of the Wright brothers airplane because Scientific American protested that the flight was a hoax, and for five years officials in Washington, D.C. claimed they didn't believe that the heavier-than-air machine had flown. Nikola Tesla, probably one of the the greatest genius of all time, built the Wardenclyffe power magnifying plant. It was one of many planned free power generating stations. Had interference not prevented it, wireless power and communications could have been available as early as the 1920s, but when financier JP Morgan realized that Tesla's plans for wireless power might result in people having power for free, he stopped funding Tesla's project. The Wardenclyffe facility was demolished in 1917. It must eventually become common knowledge that power can be produced for free using a clean, non-polluting, virtually unlimited energy sources with technologies requiring no oil, coal, or nuclear fuel, just as it became common knowledge that flying was possible sometime after the Wright Brothers flew at Kitty Hawk. Resources like oil and coal have a perceived value based on the beliefs people hold about availability. In reality oil and coal are also unlimited, since they are constantly being produced in the ground. Even if we tried we cannot use anywhere near as much as is produced. Even though oil is unlmited, the perception of reality gets tweaked by public propaganda. If you're old enough you may remember those old Gulf Oil TV commercials that gave the false notion that dinosaurs were the source of our oil. Since dinosaurs are extinct you are led to believe (in error) that all the oil we will ever get was produced from extinct dinosaurs. Now, if you don't already know, oil and coal are unlimited resources. Oil is abiotic in nature and is produced faster within the earth than we can use it. The Gulf Oil commercial played on innuendo to make oil appear scarce keeping oil prices high. Fuel efficient cars have been vanishing from the market place since poor gas mileage is good for the sellers of oil / fuel. It's inevitable that eventually a critical mass of public awareness will be reached regarding the unlimited nature of natural resources and then we will have them. Note too however that the best use of oil isn't powering cars. It's the making of non-out-gassing plastics that last forever that could be used to make plastic homes that would last forever needing no maintenance. So many cool things can come about as we become aware of the possibilities. See this video for more on plastic homes. Excerpt Link: In Dec. 12, 1936 Canadian Automotive Magazine states that the standard carburetor gets about 25 mpg at only 9% efficiency. Therefore the Pogue carburetor is 72% efficient overall at 200 mpg. In fact, many people attested to these mileage claims as The Pogue Carb went into production and was sold openly. [see Don Garlitz, above]. His invention caused such shock waves through the stock market, that the US and Canadian governments both stepped in and applied pressure to stifle him. One of the crucial factors of these systems is the use of “white” gasoline, which contained no additives. It was at this time oil companies started adding lead to the fuel. Lead is an anti-catalyst that rendered Pogue’s carburetor as inefficient as a regular carb. With a Public Awareness Kit, you'll witness a variety of revolutionary technologies and see several ways that power could be produced for free. For example on the included DVD titled "Research Projects" you'll see some mind blowing technologies such as the the amazing water-powered Ram Jet Tornado Engine. A brief look at the track record of "Experts"
The Case for FREE Electricity Video - Powerful evidence that free electricity is absolutely possible. If you missed the live nationwide Technology Tour show, this is your chance to see it. Also included is the amazing DVD titled "Research Projects" Some of the technologies on this video will simply blow your mind! The Video titled the "History of Free Electricity". See our Low Temperature Phase change engine powering an enormous flywheel from the heat energy in the air. In order to round out your understanding of just how deep the rabbit hole goes, I include several other interesting DVD's that poke holes in the establishment view and instead provide broader world view. You'll see several demonstrations of ways that free electricity could be produced, including the amazing neutrino technology and the even more amazing water powered Tornado Engine. Power Controller - save 1/3 to 1/2 the electricity to power motors. Fire Barrier Flame Retardant - non-toxic and more effective than conventional. Therm-A-Guard flame retardant paint that reduces heating and cooling bills. Fire Sentry puts out a stove fire if you forget to turn off your stove. Soni-Grow - Makes everything that grows - grow better. Insect-a-Shield Kills insects without poison, environmentally safe non-toxic. The Public Awareness Kit comes with at least 6 DVD titles that will empower you with knowledge and awareness. Discover how our lives can all be made better with revolutionary technology. Free Your Mind - Break the Matrix... Get your own Public Awareness Kit today by clicking below.